Please drop in during the day with a short text to read. “Browsed” may sound like “braust,” but what a blunder to mix up the two! As K, cautiously contemplates breaking for the summer, it beckons Anna Kanna Barham (born in Birmingham) to bestow a bespoke automaton upon Berlin: an embodied, live production writing group. Bred on a Baroque logic and the burbling banter between spoken word, language recognition software, and printed output, Barham’s brain child bends and builds different texts that each bare the bruises of audio and visual transformations. Conspiring with P. Krishn, K,’s casual collector of consonants, Barham blueprints multiple modes of broadcasting to begin our next, bookish phase. 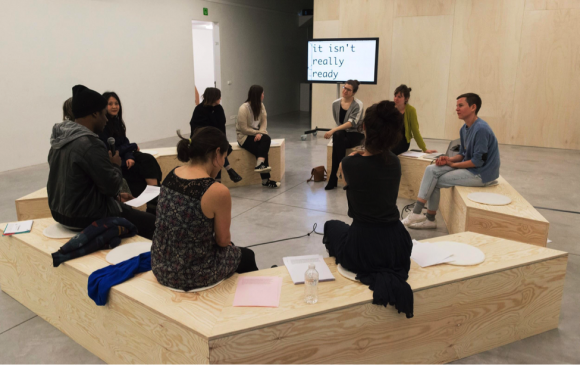 Anna Kanna Barham is a London-based artist exploring the materiality and errancy of language alongside broader issues of translation, authorship, and subjectivity. Recent commissions include Playground Festival, Museum M, Leuven (BE); Art Sheffield; Centre Pompidou, Paris; Fig-2, ICA Studio, London; and Hayward Gallery, London. Her work has been included in exhibitions at KW Institute for Contemporary Art, Berlin; The Welcome Collection, London; Künstlerhaus, Halle für Kunst & Medien, Graz (AT); Rotterdam Film Festival, Rotterdam (NL); Museum of Contemporary Art Antwerp, Antwerp (BE); ICA, and Tate Modern, London; and many others. She is currently making a new book work with Foundation Press, which will be published in summer 2018.